I am the smallest of what is called the �hairless breeds', but I'm not exactly hairless. I do have hair on my head, on my feet, and on the tip of my tail. My skin might be blue, lilac or spotted, among other colors, and the color of my skin varies somewhat, depending on what time of year it is. 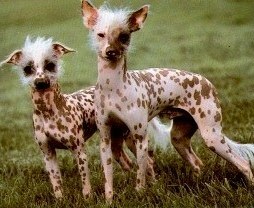 There are Chinese Crested puppies who have hair all over their bodies. They look kind of like tiny little sheepdogs and they are referred to as �powder puffs'. When fully grown, I am between 11 and 13 inches tall (27.9 to 33 centimeters) and I weigh between 7 and 12 pounds (3.2 to 5.4 kilograms). We have no Chinese Crested Breeders listed at this time. Click here to place your Chinese Crested Ad!